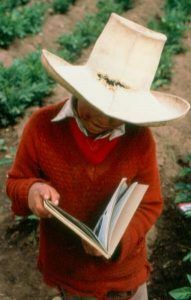 The Enciclopedia Campesina, a collection of 20 volumes that gathers together stories and knowledge from across the mountainous region surrounding the town of Cajamarca, is the cornerstone of the Rural Library Network’s literacy program. In this program community members help each other learn to read and write in small informal settings and reading circles. These exchanges foster self-esteem, revitalize cultural traditions and build community—between young and old and among the 500 remote communities that belong to the network. Heart-Links was involved in the collection’s initial publication almost 20 years ago. From years of use, the original collection is in very poor condition. Heart-Links will provide funding to reprint, over the next two years, 1000 copies of the first 8 of the 20 titles.